Iranian Foreign Minister Mohammad Javad Zarif has said in Havana his visit would open a new chapter in the Islamic Republic’s relations with Communist-ruled Cuba. Iran’s Foreign Minister Mohammad Javad Zarif, left, is on a tour of Latin America. “We will start a new chapter in the bilateral relations with Cuba on the basis of a big (business) delegation accompanying me on this visit,” Zarif said on August 22 at a meeting with his Cuban counterpart, Bruno Rodriguez. Iran, which has enjoyed good relations with Cuba, is keen to drum up business after the removal in January of international sanctions against the Islamic Republic as part of a nuclear deal. 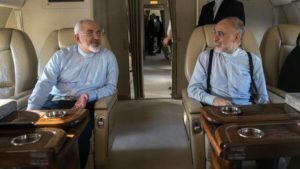 Zarif is on a six-day tour of Latin America, that will also take him to Chile, Nicaragua, Bolivia and Venezuela.